Fr. Jacob Evans is currently the Rector at St. Matthew’s Latham, NY. 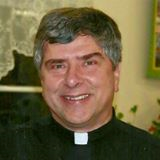 He is also active in missions with the St. Francis Loaves & Fishes Feeding Ministry, a children’s ministry, and a street ministry which are all located in the West Hill area of Albany. Fr. Jacob was ordained to the Priesthood in January, 2015. Prior to the call to St. Matthew’s, he served at All Saint’s, Round Lake, with Fr. Scott Evans. He answered the Lord’s call to ministry while serving at St. George’s, Clifton Park. He retired from his secular sales career at 3M in April, 2017. Fr. Jacob finds great joy in ministering to those in need and has been on a blessed journey serving the Lord. The Healing Service includes praise and worship music, Scripture and teaching as well as opportunities for Anointing and Personal Healing Prayer Ministry . A simple lunch is available in the Healing Center after the service. A donation of $5 is suggested. All are welcome.